Is the area wide enough to contain a flower border (or similar planting bed), as well as a walkway or pathway? Do you often find yourself cutting through the side yard in question (that is, the left side yard or the right side yard) on a practical mission? For example, if you had to push a garden cart filled with compost from the backyard to the front yard, would you tend to cut through this particular area? If so, it behooves you to build a no-nonsense walkway through the area, a surface that you will not be tripping on. A wide, attractive walkway running up and down a narrow side yard can also serve a function similar to that of a patio. If, by contrast, you do not cut through the area often, you have some less formal (also cheaper and easier) options at your disposal. For example, you could lay down garden stepping stones to create an informal path that wends its way through the side yard. Curved pathways are more attractive than straight ones (a straight path will reinforce how tunnel-like the side yard is, which is precisely what you wish to avoid) and are a good choice where aesthetic concerns are paramount. Plant a ground cover such as creeping thyme between the stepping stones, to add visual interest. Alternatively, you may choose not to have a well-defined path at all. You can suppress weed plants in the area by laying down weed fabric, covered by mulch. As long as the area is not heavily trafficked, you can also grow a nice green lawn (although this option does entail regular maintenance, so be prepared for extra work). If the area is shaded, select a shade-tolerant type, such as tall fescue grass. Ring the Call Before You Dig phone number before plunging that shovel into the ground! They will make sure you're not going to be severing any cables, etc. If you have sufficient room in your side yard, you will most likely wish to install plants there to spice up the space. Using container gardens or raised beds obviates having to dig into the soil, but let's assume that you will be installing your plants in the ground. The first thing to do is to determine whether the side yard is mainly sunny or mainly shady. Then, when you're researching your possible plant choices, be careful to note whether they are sun-loving plants or shade-tolerant plants. The preferences of the plant, rather than your own preferences, must take precedence at the end of the day. If you are planning on covering the ground with a weed fabric and mulch, a low-maintenance planting option is to "pocket plant" with shrubs. For each shrub, make an incision in the weed fabric just big enough to insert the root ball. A long, narrow side yard can have an oppressive feel to it. What can you do? Break up the expanse with an object upon which the eye can rest, for relief. One possible object to use for this purpose is a garden arbor. While such a structure can serve an aesthetic purpose even in a large side yard, an arbor will be especially helpful in improving the design in a small side yard. Enhance the arbor's beauty by training vines upon it. 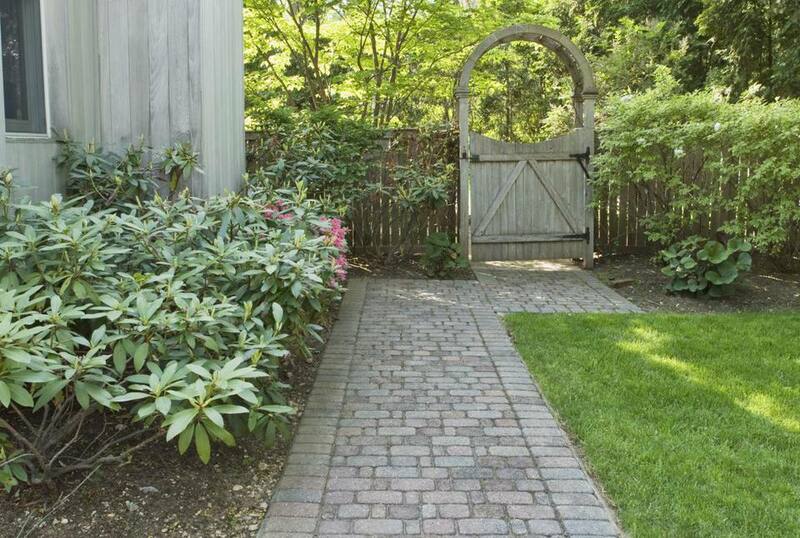 You can opt for a walkway or pathway, without planting beds (except perhaps for annual plants or small perennial flowers), if the space is really tight. If there is sufficient room, you can have both, with the path or walkway (ideally) bordered by plants on each side. You need not have a well-defined path or walkway at all. In case #3 above, just make sure that, if you grow plants in the space, you leave yourself enough room to move freely among them.